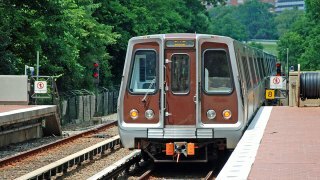 Metro trains and buses are operating on a different schedule for the Labor Day holiday. Trains on the Red, Blue, Orange and Silver lines are running every 26 minutes Monday, and Yellow and Green line trains are operating at regular weekend intervals. Buses are running on a Sunday schedule. Off-peak fares will be in effect all day Monday. Parking is free at all Metrorail parking facilities. The rail system will be open until midnight.